Last week, I angrily and publicly chastised Oakland Mayor Jean Quan for a lack of leadership on the Lake Merritt dog park issue. I was justifiably angry because after 13 years, thousands of hours of volunteer hours, and fundraising to create an area for dog owners who live in the densest part of Oakland—the Lake Merritt area—not one but two virtually-assured areas were abruptly made unavailable by the City. On Monday Mayor Quan, after reading my attack on her, graciously called me to personally discuss the issues and background information on what’s happening with finding space for people with dogs in Oakland, and what happened with the loss of Lakeview and Snow Park locations. From our conversation and her assurances, I have respect for her leadership on this issue of significant importance to such a large, diverse group of Oaklanders, and look forward to working with her. I now wish that I had spoken with her first before I wrote the letter. For that I want to apologize. PRAC Votes Yes on Snow Dog Park! At the Sept 11, 2013 Parks and Recreation Advisory Commission (PRAC) meeting, the Commission voted 6-1 to recommend the approval of the Minor Conditional Use Permit! It’s just the first step though in getting this park built. On Sept. 11th PRAC heard a motion to recommend approval of the Minor Conditional Use Permit (MCUP) to the Planning Department. Parks and Recreation staff has recommended that the proposal be approved. At the meeting, 17 speakers spoke on both sides of the issue; the majority were in favor. A handful of residents of the Regillius luxury apartments spoke against the proposal, mainly on the theory that they will be affected by noise and that a nearby dog park would negatively affect their property values. Mayor Quan briefly attended the meeting to speak in favor of the dog park, saying that the city has “been unfair” to people with dogs, and that Snow Park was a great compromise in creating a safe and legal space for people to go with their dogs. Staff from the office of Council member Lynette Gibson McIlhenney also spoke in favor of the dog park, mentioning that the Council member was strongly in favor of the proposal, and that dog parks create community space, and are effective in deterring crime. Commissioners asked questions about costs, and the city’s architect estimated that it would cost somewhere near $200,000 to build (in comparison, the children’s play area being built at Snow Park is estimated to cost $300,000). Most of that money would be privately raised by ODOG. 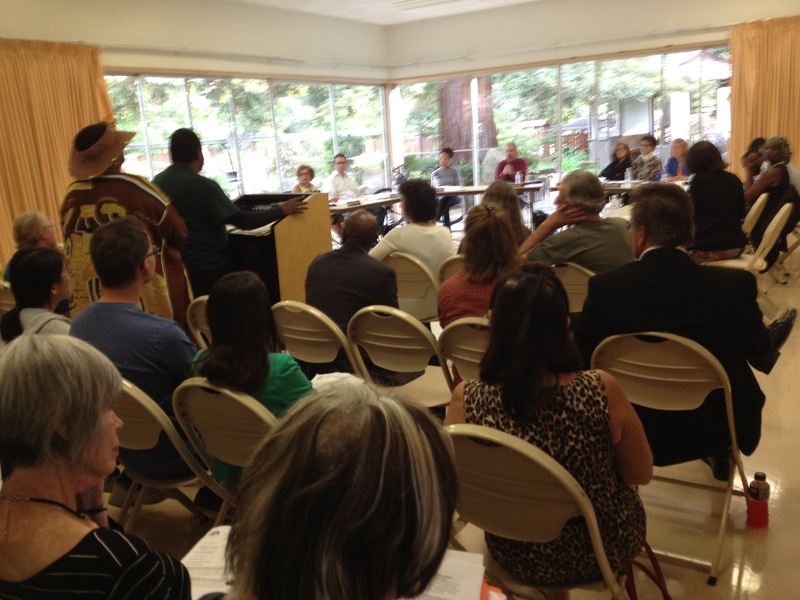 Commissioners were also concerned about maintenance, and voted to include an amendment to the MCUP proposal to include a recommendation that the city enter into a Memorandum of Understanding (MOU) with ODOG about maintenance (ODOG has long-standing MOUs with the city for the city’s other dog parks, such as in Joaquin Miller Park.) The motion to recommend the passage of the MCUP was passed by PRAC 6-1. Commission Chair Barry Miller was the lone dissenting vote, saying he’d prefer the park to remain as-is: a largely unused lawn, and he’d rather see a dog park created similarly to the new Latham Square project, where a street was reclaimed for park use. Staff from the Planning Department said that the next step was that the proposal for the MCUP would now go to the Planning Department, who would write a report. There would then be a 17 day public comment period, after which Planning would administratively make a decision. Once the decision is made, there is a ten day appeal period. If appealed, it would then go to the Planning Commission, who would be the final word. It would not go to City Council, as did the Astro Park controversy. Two major items will be heard by the Parks Commission next Wednesday. We need dog lovers in the room that day to speak out for their pups and we need you to send emails to city officials. Come to the meeting Wednesday, September 11 4:30-6:30-7. It is fine to be late. Take a few minutes to scan the dog policy draft at dog policy DRAFT for website so that you understand why it is import to tell these people that we don’t want to be stuck in blighted and neglected parks in Oakland just because they think dogs are some sort of problem. There are some good ideas in this document but we have highlighted the recurring problem of not letting dog owners use nice park space. It also would require dog owners to pay special fees that no other park users pay on top of having to privately finance dog parks.